I hope everyone who celebrates it, had a very Merry Christmas yesterday!! We woke up to a note from the elf (who had to go back home). I'm going to miss the elf and his crazy antics (like the one photographed above). 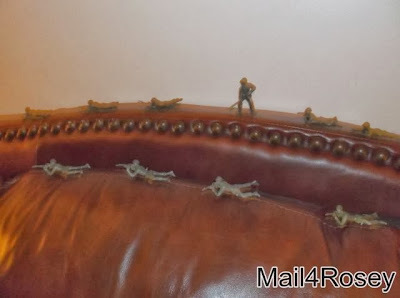 Santa filled the room w/Army men, they were everywhere! Baby Grand will be here tomorrow, and I can't wait! The grown kids are all coming in tomorrow (flying and driving, depending on the kid ;)), and new grandbaby will be here too. Her other grandma e-mailed me this picture from yesterday, and all I could say was, awwww!!!! I cannot wait to see her and kiss her little fat cheekers!! I hope everyone's got their messes all cleaned up, gifts put away, etc., and can relax a bit today. Hubby's lucky here, he's got the day off, woot!! I'm glad you had a wonderful Christmas. We did too, but I'm looking forward to relaxing today--writing, doing art, reading... Enjoy your time with your family! Thanks, Dana. Enjoy your relaxing, that sounds fantastic! Fun times! We will miss our elf too. Those little guys are fun! Sounds like a blessed celebration! Our family had a blessed time as well. Wishing you all blessings in the New Year and until He comes again! Hi Rosey! Glad you guys had a nice Christmas! We did too! I am glad it's all over though! Awww is right on this cutie pie. You'll have fun with her tomorrow. Everything is pretty much done except for the linens from the dinner table. I'll finish that up today. Outside of that you can't even tell anyone was here yesterday. Back on my sensible eating plan too. I've gained three pounds this month. Yikes. Hi Rosey - enjoy having all the family round .. sounds like it will be fun ... lots of fun .. Enjoy! I can just imagine the response that the Army men got!!! I bet your son was in Heaven!!!! I hope you had a great Christmas! Your grandbaby looks so sweet! I'd want to kiss those cheeks as well! He wasn't nice to me. He doesn't even come to our house. I guess he's antisemetic. What a cute picture of your Grandchild. I would want to kiss those chubby cheeks too! It was a really nice Christmas! I have most of the mess cleaned up! I just wish my Elf would have done it! Hope you have tons of fun with your kids! ha. our elf is gone for another year as well...sounds like santa was good to you....ha cute picture of the little one! Little kids make the holidays extra special. You are so lucky that your grandchild lives nearby...enjoy that little darling! Happy Holidays!!!! Love the picture, so adorable! Happy Day After Christmas!! Isn't it great to have grandchildren to share Christmas with? Hope you have a lovely time with the family! It sounds like an invasion! I didn't know they still made those little army men. I had fun with them when I was a kid. Wow! It must have been plenty of fun with those plenty army men! Have a Merry Days After Christmas and a satisfactory New Year! Awwww your granddaughter is such a doll. Hope your Christmas was superb. Don't walk around barefoot for a while, with those army men floating around. Ouch! 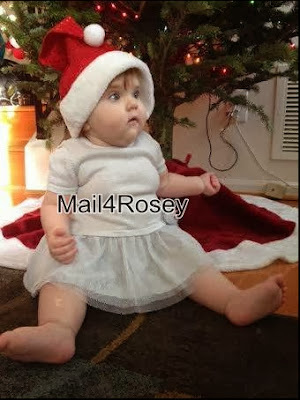 Rosey your grand baby is so chubby cheeks cute! I know you can't wait to load her up with hugs & kisses! Your granddaughter is too cute :) My husband had to work the last couple of days so my youngest and I have been cleaning up after all the craziness of the holidays. He's more dumping out his toys rather than helping, but it will get done eventually ;) I hope you had a great Christmas! How wonderful that you got a new camera for christmas!! I'm sure you're snapping away already! Those little elves are so cute. I wish they would have had them when my Daughter was growing up. What a fun time for you. Merry Christmas. What an enjoyable Christmas in your house. Precious grandbaby.... I bet I know who will be holding her most of the time. Ha New camera, huh? Looking forward to being WOWed by all the perfect pictures. Oh My Gosh!! Your little Granddaughter is so cute-- and that look on her face--lol what a big surprised look. Your one lucky Grandma. Well, cleaning is going to take some time here-- I have started taking things and putting them away for the most part of the bathroom and kitchen and halls--got most of the holiday linens washed and folded ready to find the container they go in for an year. It took me over six days to decorate--I am sure it will take me that long to put everything away. 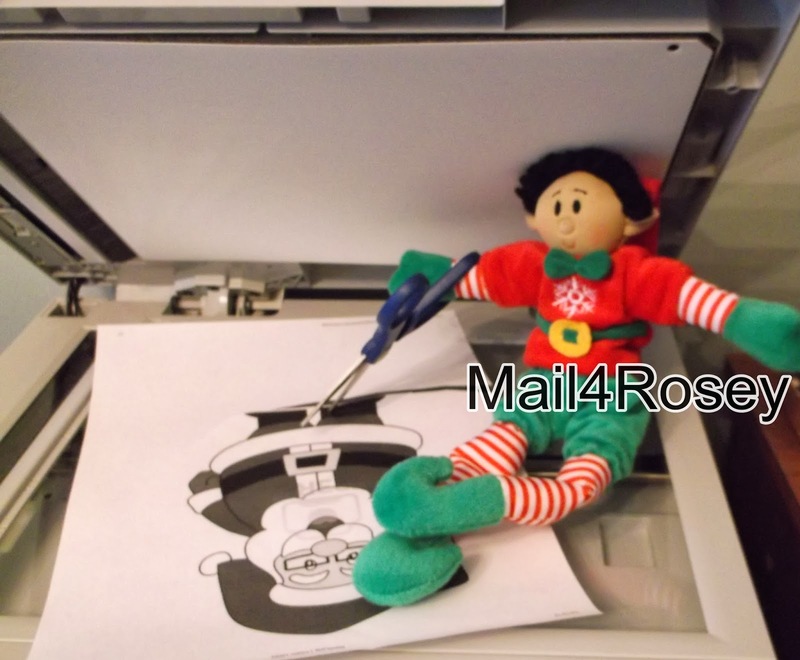 We do have a couple elves that stay out all year long...they just are shelf setters watching all year long--lol. Thanks for sharing. I can't wait to see what else you will be posting soon. You'll have to explain the elf on the shelf thing to me. Baby girl is just yum. Smooch her lots! i'm glad your Christmas went well!!! LOL! Great story and I love the Elf. LOL to your daughter getting the same gift from everyone. I can't wait to see your crystal clear pictures but I think the one of baby girl and the army men are great! This looks like such a great heater!